The Dynamic Sectorisation Operational Trial (DSOT), the first such trial in Europe to take place in high intensity airspace, is being undertaken by NATS and our FAB partner the Irish Aviation Authority (IAA). The trial is intended to inform issues that need resolving in order to deploy this concept of flexible use of airspace across FIR/ACC boundaries. Dynamic sectorisation is an enabler for the future deployment of free route airspace across the UK Ireland FAB. Phase one of the DSOT trial ran from January to September 2014. It involved delegation of a portion of Prestwick’s Rathlin West sector (above Northern Ireland) from NATS to the IAA, this airspace being an important gateway for flights to and from the North Atlantic. Phase one of the trial involved 52% of the Rathlin West sector, as the map (below) illustrates. 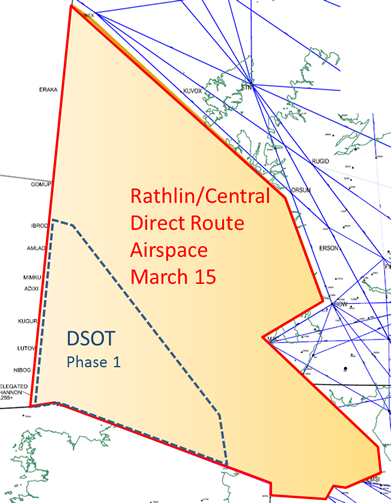 Building on the experience from DSOT, NATS will implement Direct Route Airspace (DRA), a key enabler for implementing free route airspace, across the whole of both Rathlin and Central sectors from 5 March 2015. This portion of airspace is some 460% larger and will therefore deliver significantly greater benefits to our customers.